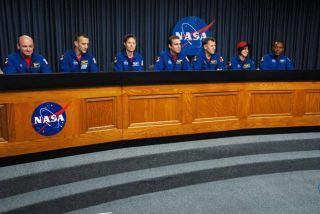 At the NASA television studio, the STS-118 crewmembers answer questions from the media during a news conference after their Aug. 21, 2007 landing. Seated from left are commander Scott Kelly, pilot Charlie Hobaugh and mission specialists Tracy Caldwell, Rick Mastracchio, Dave Williams, Barbara R. Morgan and Alvin Drew. CAPECANAVERAL, Fla. -- Teacher-turned-astronaut Barbara Morgan and her fellowcrewmates are glad to be home after the successful Tuesday landing of theirspace shuttle Endeavour. "Theflight was absolutely wonderful," Morgan, a formerIdaho schoolteacher, told reporters as she readapted to the constant tug ofEarth's gravity. "The room still spins a little bit, but that'sokay." Morgan andher six STS-118crewmates landed at 12:32:16 p.m. EDT (1632:16 GMT) here at NASA's KennedySpace Center to end a successful13-day flight to the International Space Station (ISS). "Itwas a great experience," shuttle commander Scott Kelly told reporters,adding that the station's three-man Expedition 15 crew contributed to theirflight's success. "The space station is really a wonderful place and itcontinues to get bigger and have a greater capability to do science." Endeavour'sSTS-118 crew spent nine days at the ISS, where the astronauts delivered morethan two tons of cargo, replaced a broken U.S. gyroscope and installed a spareparts platform and $11 million starboard-side addition to the orbitallaboratory's backbone-like truss. Shuttlepilot Charlie Hobaugh and mission specialists Tracy Caldwell, Rick Mastracchio,Alvin Drew, Jr. and Canadian Space Agency astronaut Dave Williams also returnedto Earth aboard the shuttle. "It'struly the ride of a lifetime," Williams said of launching aboardEndeavour, adding that the views of Earth and the moon during his STS-118spacewalks will stay with him. "These are moments that you truly take awaywith you." At no pointwere they worried about a small,deep divot in their orbiter's tile-covered underbelly, the shuttleastronauts said. The 3 1/2-inch by 2-inch (9-centimeter by 5-centimeter) gougewas caused by foam debris shed by Endeavour's tank during its Aug. 8 launch,but posed no risk to the safe return of the orbiter or its crew. "I wasa little bit underwhelmed by the size of the gouge," Kelly said after heand his crew inspected their spacecraft. "To see it, it looked rathersmall." For Morgan,Endeavour's STS-118 mission capped a 22-year effort to reach space. NASA firstselected the McCall, Idaho, elementary schoolteacher to serve as the backup toTeacher in Space Christa McAuliffe, who later died with six astronauts duringthe agency's ill-fated Challenger shuttle in 1986. NASArecalled Morgan from her teaching post in 1998 to train as a professionalastronaut. She was assigned to Endeavour's STS-118 flight in 2002. "Theblackness of space, I've never seen anything that black," Morgan said. "It was like obsidian, only blacker." During herspaceflight, Morgan recorded video for educational sessions, answered questionsfrom students on Earth and hauled about 10 million cinnamon basil seeds tospace and back as part of a NASA student outreach project.? "I'mreally proud with what we did," Morgan said, adding that NASA has set up aground-based education program for students in lieu of a lesson from space. "We're going to give them these seeds and let them experiment, explore anddo whatever they want with them and get them to have the kinds of experiencesthat we have." Morganadded that participating in the construction of the space station, and NASA'svision to return astronauts to the moon, is both gratifying and inspiring. "Youknow, there's a great sense of pride to be able to be involved in a human endeavorthat takes us all a little bit farther," Morgan said. "When you lookdown and see our Earth?and you realize what we are trying to do as a humanrace, it's pretty profound."